The subject of secondary, or â€œback-upâ€, guns has been debated to death over the years, and Iâ€™d rather not beat that dead horse. But, Iâ€™m asked about it on a regular basis and I think I might be able to throw in a few thoughts that are often left out of the debate. My approach here is not should I do it, but why I do it. Also, I refrain from calling either of my guns a â€œback-up.â€ I refer to both as primaries, and I refer to both as secondaries – it all depends on which one I draw first, which Iâ€™ll elaborate on later. Every gun regardless of brand, when used, will eventually break. Iâ€™ve actually broken 5 Glocks over the years. Such events require new parts and/or attention of an armorer. As an Instructor, I see mechanical failures of pistols on a regular basis; enough so that I consider it a distinct possibility in a fight. These failures are always a complete surprise to the owners and occur at the most inconvenient of times. Iâ€™m personally not interested in finding myself without the second gun option when my first becomes a paperweight. Failures to feed, extract, eject, and fire, as well as reverse feeds, are common. I see such things constantly in class. There are multiple causes for each of those occurrences, but diagnosing the cause is not a priority during a defensive situation. A tap/rack will fix most problems, but not always. Default to secondary. 3. Drawing a second gun is a faster way to reload. In my travels I have yet to meet anyone who has reloaded their gun during a citizen involved defensive shooting, but we have had incidents evolve during force-on-force scenarios where tap/racking or transitions to secondary have occurred due to the primary gun experiencing a failure. In every case, transitioning to a secondary was ridiculously faster than any attempt at fixing the misbehaving primary. The only exception being guns carried in ankle holsters â€“ those tend to create more problems than they solve when fights are up close and personal. Those 3 reasons comprise most of the standard rationale behind the â€œback-upâ€ gun. This may surprise many, but they are barely in the running for reasons why I carry two guns. As is usually argued by those who think a second gun is a waste of time, citizen involved gunfights in America are typically three seconds long, happen within three steps of the offender, and require three shots. The time one is involved in this fight offers little window for drawing secondary guns, or even tap/rackingâ€¦maybe. Those numbers are arrived at from situations where the vast majority of guns deployed by defenders actually function and result in a physical or psychological stop. Itâ€™s that rare occasion when my gun doesnâ€™t work that is our real concern, and the data on those events is minimal. When one fights with the Henk Iverson truism of â€˜Position before transitionâ€™, one could foresee circumstances unfolding where an attacker is fought off and distance is created, so Iâ€™m not willing to say a tap/rack or transition to secondary could never occur. But, as already stated, I have yet to hear of a citizen involved defensive shooting where anyone reloaded their gun during the fight. There very well may have been one, but I canâ€™t name it. And even if one exists it would be in the exception that proves the rule vein. So, itâ€™s a consideration, but not much of one. 4. I carry two pistols in different positions to allow draw of at least one regardless of how Iâ€™m pinned against a wall or how I land on the ground. It also gives me a better draw option when seated or riding in a vehicle, especially with a seat belt on. 5. I carry two pistols in different positions that will allow me to draw with either my right or left hand. I may start this fight with an injured limb, holding on to something important (like a child), or dragging another person. The practice gives me options. 6. I can arm a second person. Many of us wish that more people we know and love were armed, but the reality is that some just choose not to be. Those reasons range from reasonable to ridiculous, but, the reality is that we often find ourselves in the company of those who know how to operate defensive weapons but are without them. Passing a gun to a second person changes their status from someone I have to shepherd to a force multiplied partner. Also, as distasteful as the thought is, carrying my pistols in different positions will allow those Iâ€™m close with to retrieve a gun from my lifeless body regardless of how it hits the ground. 7. I can re-arm myself. Have I ever dropped a gun during a drill or force-on-force training? You bet. Sweat, blood, stress, close contact, climbing ladders, taking a fall, taking a hit in the strong hand, etc., all contribute to the potential. Could there be a fight for my gun that I lose? Hate to say it, but there is a chance. I train to prevent that, but nothing is 100%. Numbers 4 through 7 are, in my opinion, more important reasons to carry two guns, but they still arenâ€™t the main reasons that I do. I donâ€™t carry two guns in anticipation of a mugging; I carry two guns in anticipation of being present when a group of murderers, hell bent on taking as much life as possible, begin doing so. We do not live in 1950â€™s America anymore. There are legitimate threats that are bigger and more destructive than the common criminal. I walk this Earth with that in mind, and the equipment to respond. Granted, itâ€™s not the best equipment due to concealment issues, but itâ€™s the best I can do under the circumstances. 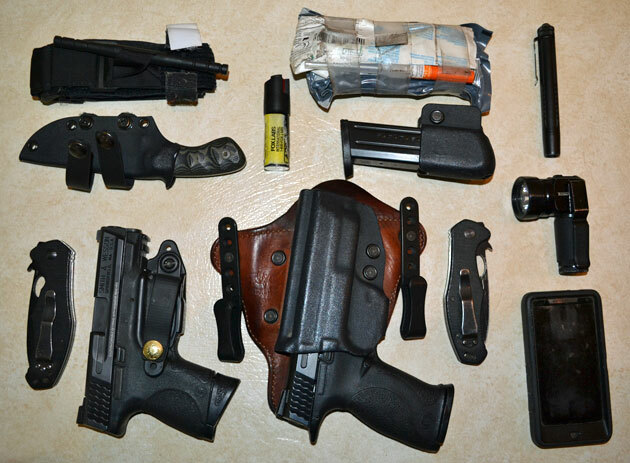 At least two guns that share the same magazine, a reload, blades, a trauma kit & tourniquet, a proper flashlight, and the ammunition choice of Corbon DPX â€“ that gear goes out the door with me every day. Two guns and a reload will keep me in the fight longer against multiple attackers â€“ simple as that. 46-rounds gives me time – time to escape, evade, and take out threats. And, in fact, Iâ€™m considering adding a second reload to my gear. Mumbai, Beslan, Nairobiâ€¦these are not interesting historical footnotes, they are WARNINGS. And a study of them leaves one seeing 50+ rounds as the bare minimum. Throw in the beheading of a woman in Oklahoma last week, and picture of the future starts to form. As John Farnam so often says: Your next fight will be a come as you are affair. There will be no running back to the car to grab your med kit. There will be no helicopters dropping resupply. Youâ€™re not going to â€œfight your way to your rifle.â€ If itâ€™s not with you, you wonâ€™t have it. Some will still argue that carrying two guns is too much â€“ that theyâ€™ll never both be needed and Iâ€™m just being paranoid. My answer to that is: I sure hope so. Frank Sharpe has been a Firearms Instructor for 15-years, and is the owner and Lead Instructor of Fortress Defense Consultants. He spends his time teaching people how to shoot people, and as a student of that Art. Frank may be contacted directly at frank@fortressdefense.com. How do you carry ALL of that every day? Trench coat in summer? It ain’t easy, but it’s easier than dying because I don’t have it. Way to go HillBilly. 14 Years LEO, 4 years USA. I leave the house this way: G22 or 1911 w/ reload, LCP w/ 2 reloads, fixed blade, folding blade, light. Being 6’2″, 220 lbs. does help me carry the bigger weapons, but my wife goes out 9mm XDS + LCP + Blade and she is only 5’2″! Better he who has but does not need than he who needs but has not! Biceps and manhood don’t count. Great article sending this to my lady as we speak. Lots of things i didn’t consider, two platforms that use the same mags, and carrying a medkit. Cargo pants are definitely mandatory now. Funny how all the so-called “masters” of guncraft have EVERYONE practice “quick” reloads, when in reality, it’s not needed. Another BS tacticool thing to add to the list.